Summer Broaden01263 715779work01603 870304fax Self-cateringSummer Broaden, part of converted farm buildings on Apple Blossom farm, is in the village of Horningtoft, south of the market town of Fakenham in North Norfolk. This is an ideal location from which to explore the attractions of Norfolk which include Fakenham race course, sandy beaches at Holkham, Wells and Brancaster, and the cathedral city of Norwich with its castle, restaurants, museums and shops. • Outdoors: Sunny patio area to front with garden furniture & barbecue. 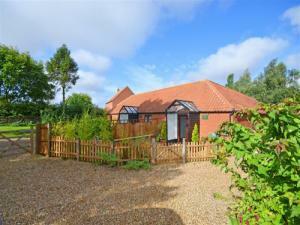 Large private garden with shed, patio area and some mature trees across access drive to Honey Pippin. Summer Broaden, part of converted farm buildings on Apple Blossom farm, is in the village of Horningtoft, south of the market town of Fakenham in North Norfolk. This is an ideal location from which to explore the attractions of Norfolk which include Fakenham race course, sandy beaches at Holkham, Wells and Brancaster, and the cathedral city of Norwich with its castle, restaurants, museums and shops.